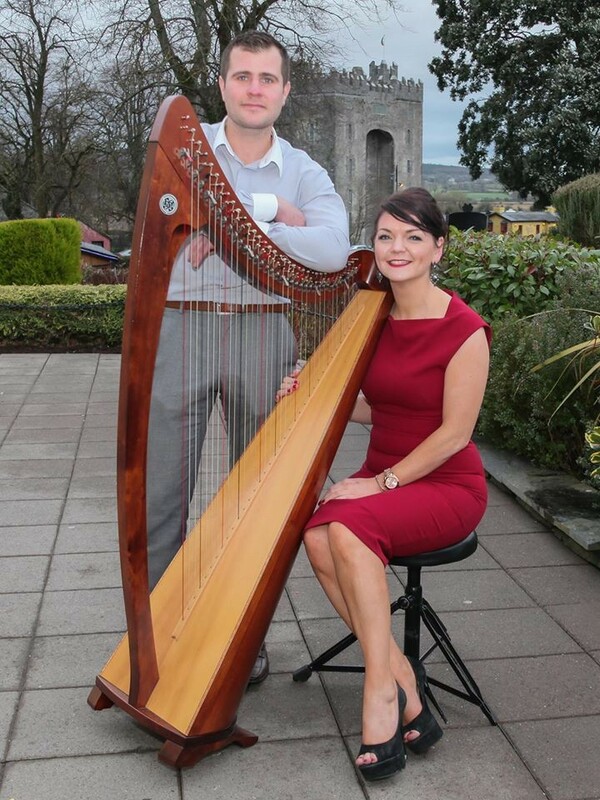 Grainne & John are a Harpist, Guitar and vocalist combination specialising in Wedding Ceremonies and Drink Receptions. Grainne & John encompass a vast range of experience which is complemented by a wide repertoire to match. 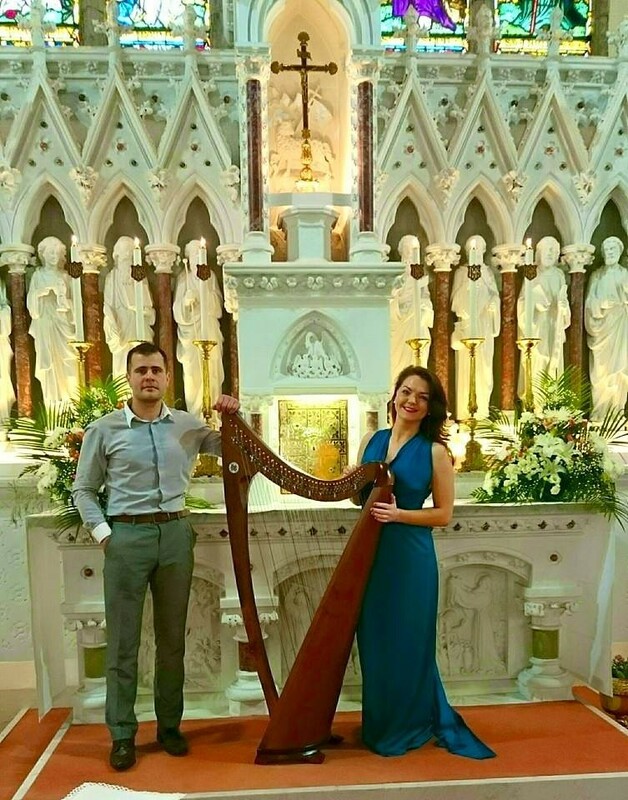 Together they work to create a unique arrangement individual to every couple using a mixture of Secular, Non-Secular, Modern and Traditional music The harmonies created by Grainne and Johns voices coupled with the harp are sure to create an unforgettable atmosphere guaranteed to set your day apart from the rest! "Come What May" - Moulin Rouge, performed by Grainne & John! "Clouds Veil" performed by Grainne & John. John performing "All I Want Is You". Grainne and John are two incredible people and two spectacular singers. They go above and beyond to become part of your day in a personal way that every bride and groom could only hope for. We lost my father in law three weeks before our wedding and Grainne and John made us feel he was there. With us through their music and we will forever hold that magical feeling they brought to our ceremony in our hearts. They truly deserve recognition for what they bring to a wedding day and especially to ours where they recognized our heartbreak with our loss and happiness with our marriage and merged it to something truly spectacular through their songs . Thanks so much Lisa! Looking forward to the big day! Was totally blown away by John and Gráinne at recent wedding I attended. They were amazing. Can’t wait to book them for my own ! Hi Rachel! Thanks so much!! We will look forward to it! Grainne and John were absolutely amazing. They completely set the scene for my friends wedding and made it truly magical from start to finish. I couldn't get enough of their beautiful voices and harmonies and was absolutely transfixed by every line they sang. I've booked them for my own wedding next year and must say that they are an absolute dream to work with too in the run up to it. They have a massive repetoire of songs as well as being completely open and willing to include additional songs we requested. I've been recommending them to everyone since I heard them sing. I can't wait to hear them sing on the day of our wedding and am feel so lucky to have wedding singers whose voices w e love so much and singers who we trust completely in the run up to the wedding. I would definitely urge anyone getting married to book Grainne and John. Hi Hannah! Thanks so much for your amazing review! We are so excited to perform at your big day! Looking forward to it! John and Grainne sang at a wedding I was a guest at recently. Their beautiful music and singing added so beautifully to a very special wedding cermony. John singing the prayer was absolutely amazing! Any couple would be lucky to have John and Grainne involved in their special day. Hi Vicki! Thanks ks so much for your lovely review! Delighted that you enjoyed our singing! Grainne and John were a pleasure to work with from day one. Very professional and really talented. 3 weeks on from our wedding and guests are still talking about how amazing they were, that says it all really. They will make anyone's wedding day a special one. Absolutely amazing wedding singers. We would have no hesitation recommending them to any future couples. Grainne and John are complete professionals, gave us great advice and guidance when asked. And as for the Singing itself, the guests were talking about them the whole weekend and still are. Just fantastic. Absolutely amazing - so professional and talented. We are still getting compliments on how amazing they were at our wedding. Such a good decision, book them you will not be disappointed. Where to start with these two! They absolutely blew us away when they performed for our wedding a few months back. When I was struggling to pick the perfect songs, Grainne stepped in and gave some brilliant and honest advice and she could not have been more right, everything was just perfect! Both John and Grainne have the most magnificent and powerful voices and our guests spoke of them for weeks and weeks afterwards!! We can't thank you both enough and we would recommend them to anyone! Absolutely amazing! I could not recommend Grainne and John highly enough. They made our wedding ceremony so special. "The Prayer" blew everyone away including the priest! And my guests are still talking about how brilliant they were. They were so easy to deal with and so accommodating when it came to choosing our songs. They made the run up to our wedding stress free and made our day so special. OMG!!! Grainne and John were amazing. I had goosebumps throughout!! The range Grainne can sing is unbelievable. They compliment each other exceptionally well. They would be brilliant in concert!! Elaine! Thanks so much! Delighted that you enjoyed it so much! Excellent to deal with, so reliable and very willing to learn new songs for couples. Would highly recommend these guys. They are fantastic! Thanks so much guys! It was a pleasure working with you, we're delighted that you were so happy! We have been to a few weddings with John & Grainne been the wedding singers and from the moment they start to the very last song they just blow your mind away with both music and voice. Their performance of 'The Prayer'is like nothing I've heard before. We were so impressed by them that we have booked them for our wedding next September. They are so talented. Shirley! Thanks so much! Delighted that you were so happy and looking forward to your own big day ???? They were unbelievable. Everyone was in tears in the church. Your hair would stand on the back of your head.I would highly recommend. Hi Nuala! Thanks so much! Well have to mind that roof ???? Hi Deirdre, thanks so much for your kind words! Really appreciate it! Grainne and John were amazing. Their voices blend together so well and the support of the harp is fabulous.They were the highlight of the wedding. Everyone is still talking about them months later. Excited for the wedding video to re listen to them,all of the songs they sang were beautiful and I remember thinking at communion i could listen to this all day but then they sang the prayer and WOW they lifted the roof off the church the power and control in their voices incredible. I have recommenced them to everyone I know. Our wedding was magical because of Grainne and John. They are truly amazing. Right from the first conversation they couldn't do more for us. They helped us choose music, they advised on the layout of music within the mass booklet, the answered all calls and emails immediately and above all they rose the roof on the church. They were simply amazing. Their rendition of the prayer had the whole congregation in tears, it was so beautiful. People commented that they would pay to hear them in the opera house. If you are looking for musicians and singers go no further. They are flawless. I even changed my mind on a song 2 days before the wedding (bridezilla ????) and they were happy to learn it on short notice and performed it perfectly. I got my video back this week and i had hairs standing on my arms hearing them again. Couldn't recommend them highly enough. I don't even know where to star with these two!! From the start Grainne was so accomodating and friendly, nothing was too much bother, and she gave honest and sound advice regarding our music choices and really helped us pick songs that would add to the ceremony. We heard them at a friends wedding and knew we had to have them for our own. On the week of our wedding a snow storm hit, and the country more or less came to a standstill. Many of our guests, and indeed some suppliers had to cancel as conditions were just too bad to travel. I didn't even have to ring Grainne & John so see if they were coming, Grainne rang me and assured me that all was in hand and that I was not to worry about anything. It was only after the wedding I realised the lenghts they had gone to to be at the wedding for us. Both were snowed in and had to load all their instruments and speakers etc into tractors (!!) to get them to the main road, and then organised further transport from there! Imagine putting a harp into a tractor!! This brings me to the music itself. OUTSTANDING. When I say these two made the ceremony, I really mean it. The lead up to the wedding was obviously stressful with suppliers/guests cancelling, but honestly when I was sitting there beside Philip, and these two were lifting the roof, all the stress just melted away and it was all worthwhile. The singing was the talk of the entire wedding, and months later still is. Words cant express how magical they are live. I cant believe what Grainne and John went through to deliver for us on our special day, to say they went above and beyond is an understatement. These two are the next level in terms of professionalism, warmth and ability, from the bottom of my heart THANK YOU and honestly if anyone is considering booking them, do it! You will be left with memories for a lifetime! Amazing wedding singers! It's a year on now and people still tell me that they made the ceremony. 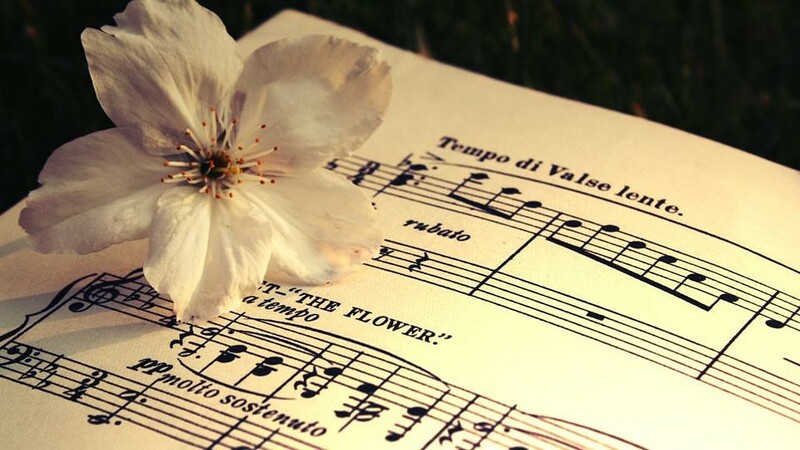 They will help you to choose the right songs for you and the right places for them in your ceremony. I would recommend them to everyone. Thanks so much Danielle! Glad people are still commenting on it and that it went down so well! Delighted! I cannot recommend Grainne and John enough. They were by far the easiest people to deal with and made the whole experience easier. They made the most beautiful recommendations for our mass. Every single person commented on the beautiful mass. The Prayer absolutely blew us all away. Any bride or groom looking for beautiful singers and harpist should look no further. You will not regret it, I promise you! Thank you Grainne and John!! Grainne and John both played for us during our ceremony. I couldn't recommend them high enough. There is no right words to use to give them justice, they were just unbelievable outstanding. When they sang the prayer they literally nearly lifted the roof of the church it was incredible. Every one of my guests spoke about them on how they have not heard anything like it before. Guest were left with goosebumps. They were fantastic to deal with over the last few month's Grainne was amazing with giving me guidance and listening to what we wanted from them. They were just amazing in every way. 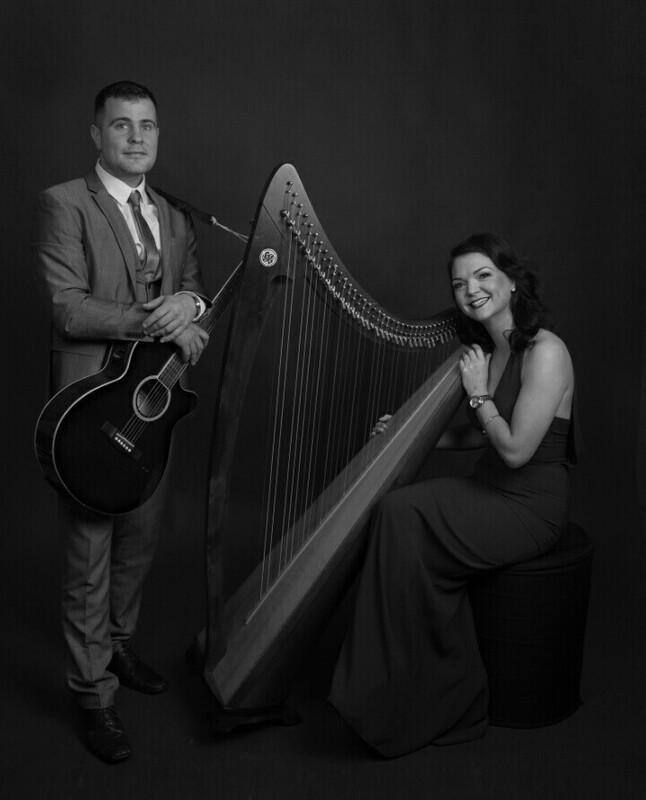 We first heard Grainne and John sing at a wedding fair and they immediately had our attention from across a crowded room. Wow! We booked them there and then.Their voices are just absolutely stunning. They were an absolute delight to deal with and so professional. Nothing was too much hassle and Grainne was absolutely fantastic in helping me plan the music for the church ceremony. Honestly could not recommend them highly enough. Our guest are still taking about their performances at the church, particularly their performance of 'The Prayer'. Really added so much for our ceremony and were a joy to deal with. Young and old loved them and their voices together are fab! Highly recommend! John & Grianne were amazing to deal with from the second we decided to book them. So helpful in deciding which songs we should have. Their voices are simply breathtaking. I was asked countless of times throughout the day "who were the church singers?" I have recommended & will go on recommending John & Grianne to anyone who gets engaged. Thanks for make our day so special x.
Grainne and John were amazing ,they were so helpful in every aspect from picking music ,any particular song we wanted they were happy to learn it..wow did they deliver I always have great memories of my day because of there outstanding performance..highly recommend grainne and John to any future brides getting married,they give you goosebumps ,my friends and family still talk about them..thank you both for all you done for us you made it more special,day to remember. Wishing ye all the best and luck in the future.???????? I couldn't recommend grainne and John enough...from start to finish they were a pleasure to deal with. I fell in love with grainne and John when I heard them at a wedding fair and booked them immediately. They were so friendly to deal with and nothing was too big or small for them. They done what we asked. I still cry when I watch my wedding dvd back and hear them sing the prayer ???? omg it still gives me goosebumps. Grainne and John played at my sisters wedding recently and there aren't enough words to describe how good they are. They compliment each other beautifully. Their singing will leave you with goosebumps and the hairs on the back of your neck standing. They received a huge round of applause and rightfully so. Everyone at the wedding said they'd never heard such amazing singing at a wedding. Would highly recommend them to any future bride. I cannot recommend Grainne and John enough! They are really nice people, super to work with and really made our day very special with their beautiful voices and musical talents. We first came across them at the Killarney Wedding Fair, they sang 2 songs on stage and literally the whole crowd stood still to listen to them, enchanted with their magical sound. We of course booked them straight away. When it came to deciding what music to use for our ceremony they were more than helpful giving good guidance and helped us pick the right songs that were a reflection of our characters. They even learned songs that were not in their portfolio. But the overwhelming memory of the day for a lot of our guests was a song that was performed at the end of the ceremony. My husband, along with a gang of his friends wanted to sing a surprise song "Stand By Me" at the end before we walked down the aisle. Now, they arent the best singers in the world and were a bit nervous about it but John and Grainne were super and put them at ease. The song went down really well, the whole congregation were singing and having good fun with it. Our videographer said it was amazing and something he had never seen before. He had the video up on his website before the end of the day!! lmweddingsvideography.com . Thank you Grainne and John so so much for everyting, you really did make our day really special. Grainne & John were absolutely brilliant on our wedding day over two months later our guests are still talking about our church music. We would like to thank them for their professionalism and for sharing their special talent with us and our guests. We highly recommend them to all future couples. 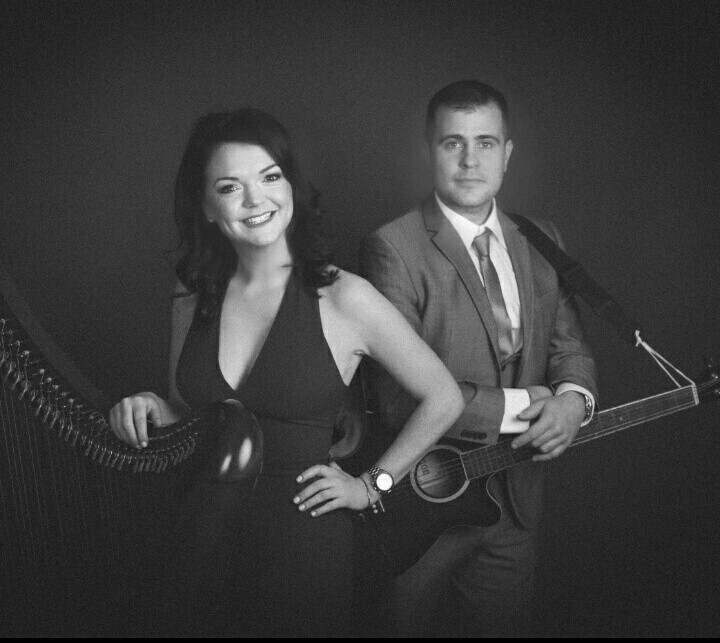 We had the pleasure of Grainne & John singing at our wedding last August. They were just so fantastic on the day & sounded brilliant on our DVD! They are both so talented and professional at their job and I would highly recommend them to any couple! When speaking to Grainne about songs she was so helpful and any request we had was done! Thanks again Grainne & John for yer beautiful singing! Absolutely excellent church music for our wedding! All the guests were super impressed with the music! Really beautiful-so good at what they do!! Heard Grainne and John perform at my cousins wedding in August, all I can say is wow. The mix of music, their epic voices, the harp... it was truly beautiful. during the more romantic numbers I had to wipe a tear and most people were the same. I saw the bride whisper 'thank you' during a particularly beautiful performance to a friend who recommended this duo, I don't think you could give a better endorsement than that. We had previously listened to a few of the demos on their website and immediately fell in love. When they played for our wedding ceremony the entire crowd including ourselves were just in awe from start to finish. We are delighted that such lovely people were such a beautiful part of our day and we would recommend them to anyone. Amazing!!! They made the ceremony, they really lit up the church! People are still saying how lovely the music was on our wedding day! Grainne & John were amazing! Their singing was note-perfect throughout. They wowed our guests! We would definitely recommend Grainne & John to any prospective couple. Grainne and John thank you both so much for singing at our wedding,ye were absolutely amazing...all our guest there were blown away by your talent and there was a round of applause after the prayer, fantastic performance.....I will highly recommend you both to anyone I know getting married. Great service, very professional and amazing to deal with, Thank you again for being part of our special day. Grainne and John, where just brilliant singing at our wedding, it was just magical. All our guests had nothing but praise for them some even said they felt like they were at a concert. We can't thank them enough. Truly amazing and such nice people to talk to, cannot recommend them enough. Grainne was top class to deal with from day one, from her suggestions for song choices to the execution on the day, we could not have asked for any better. We knew they were good but they exceeded our expectations and more!! 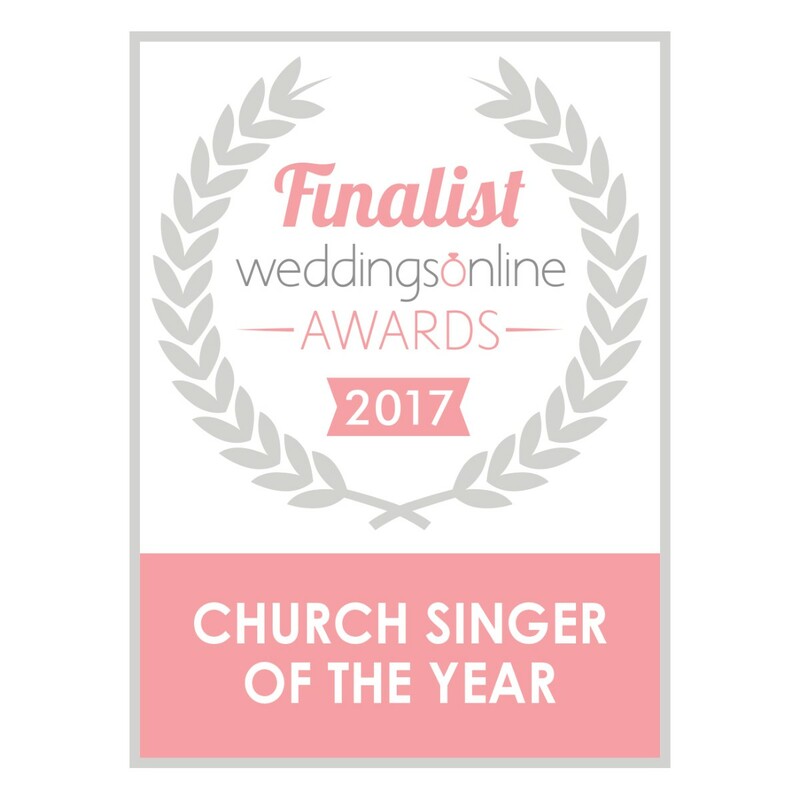 Many of the guests commented that they were blown away by the music at the church and I am confident that they will have lots more weddings from their amazing performance on the day. I would recommend anyone to book Grainne and John if they are looking for something special for their day. From the beginning they were so wonderful to deal with, had no issues learning new songs and were so professional. To this day we are still being told how amazing they were. Grainne and John were absolutely amazing at our wedding. We were so happy that they could travel from Tipp to Kerry to perform at the church and the drinks reception. From the beginning both Grainne and John were so easy to deal with and learning new songs was not an issue. 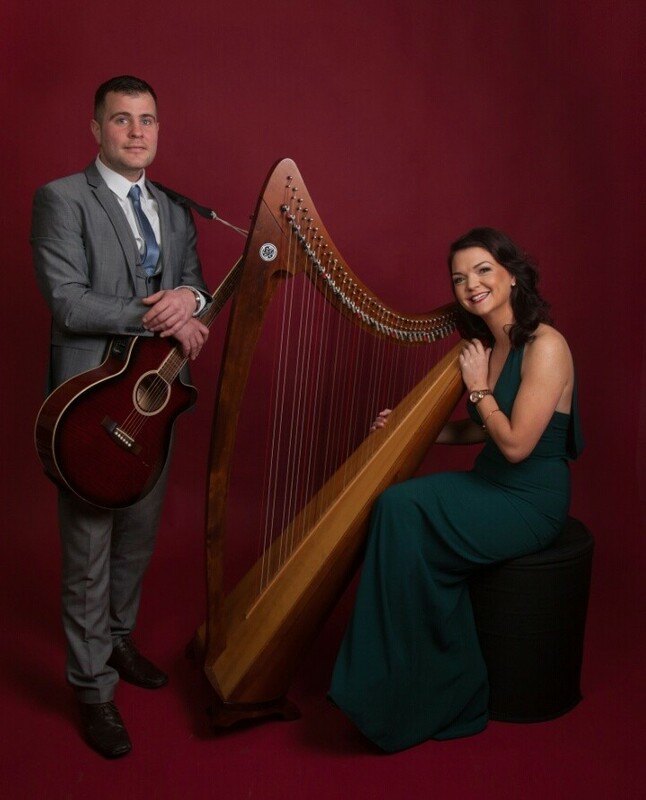 All of our guests commented on how talented they were and how amazing they were and were delighted to see Grainne and John play during our drinks reception also. We really could not recommend these two more, they really did make our day so special. We will never forget the songs that were sung at our wedding, especially The Prayer'. Absolutely amazing. Would travel the ends of the earth to hear these two again. Aine! Thanks so much for your review! It was so lovely to be part of your day, the Kerry lads are great craic! :) It was a really lovely ceremony. With every best wish for the years ahead, Grainne and John. Grainne and John sang at our wedding ceremony last weekend and were stunning.grainne was so much help when choosing songs and nothing was impossible.they got a round of applause after they sang the reflection song "the prayer".one of our guests said he wanted to clap after each song they sang!! They really added to our mass and everyone at the reception were talking about them.i would really recommend them to any future couple getting married. A brilliant performance ...... I highly recommend Grainne and John for any Church ceremony, they will make it an occasion to remember..... 5 star!! We had Grainne & John for our ceremony music this October and they were the single most talked about aspect of the day. From start to finish Grainne was a pleasure to deal with, her easy manner, warmth, guidance and willingness to learn new songs really took the stress out of planning it as I didnt have a clue where to start with ceremony music! They took our breath away on the day, as they did everyone elses, people still ask me where I found them and how I managed to get them to do our wedding, each song was genuinely better than the next and when they sang The Prayer they brought the house down! They got an impromptu ovation and the priest said he had never heard anything like it before! There was complete silence in the church when Grainne sang Nella Fantasia, amazing!! I have had lots of people looking for your contact numbers and I would have no hesitation in telling people to book these two quick! A touch of class. I honestly cannot recommend Grainne and John enough! The music made our day so special,I really felt that they got to Know us as a couple and helped choose a range of songs that complimented our ceremony perfectly. Grainne and John are so talented, many of our guests commented on the wonderful job they did on the day and how they would love to see them Perform again,to be honest I was sorry I didn't book them For the drinks reception too! 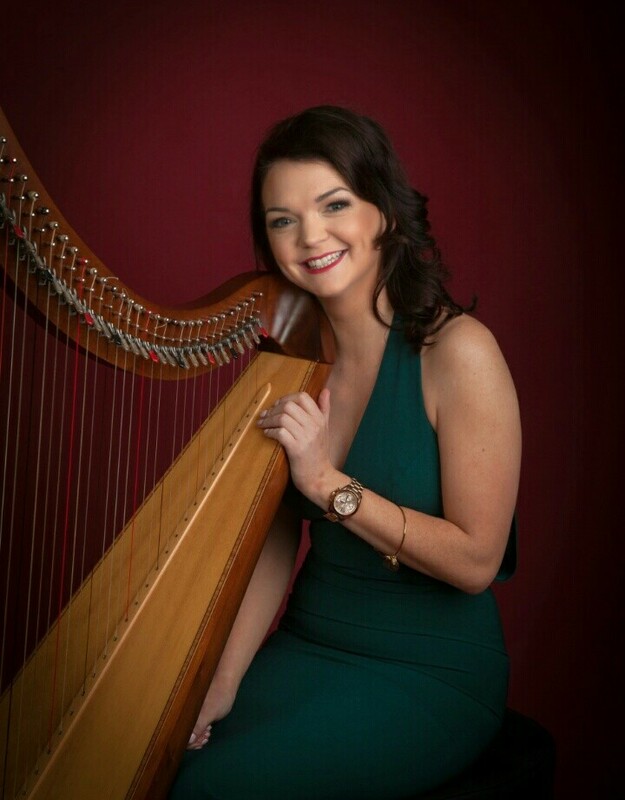 I would recommend them to any bride and groom that wants to make their ceremony special and individualistic, they really take it to another level,if I could recommend a song that has to be included, when Grainne sang nella Fantasia it felt like time stood still. Cannot recommend this musical duo enough! 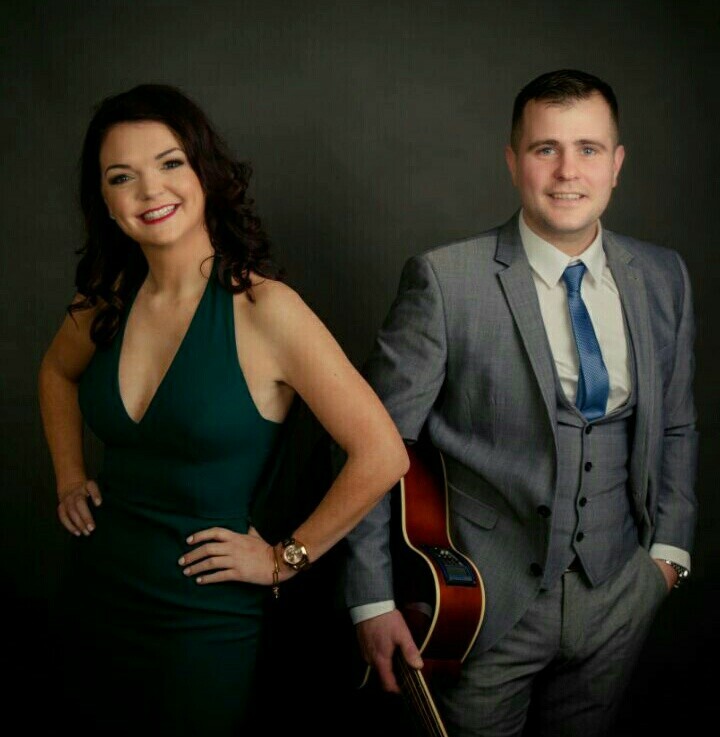 These are a fantastic duo for your church entertainment, if you are looking for the wow factor these are the people to book, they have a great repertoire and Grainne was very personable & bubbly when putting our arrangement together, took the stress out of everything. The first time I came across this duo was @ the UL wedding fair, they were doing an opera piece and everybody stopped and turned when they performed, afterwards the queues at their stall for bookings was crazy. Watching our wedding video back you can see the guests whispering & looking on in awe they belted the tunes out, as soon as we came back to our drinks reception our guests were asking who they were, how amazing they were, some had hairs stand up on the back of their necks, we got married in the Aran islands and people were still talking about them getting off the boat home, a real wow factor, a great theatrical operatic type range of music that was just so different and stunning, a few of the girls in my bridal party commented that John was very easy on the eye as well :) we were extremely happy with them, big thumbs up from us!! Both grainne and John played for our wedding. It is without a doubt the most special moments we treasure from the day. Grainne was amazing in helping us in the run up to the wedding to choose all out music and songs. Even wit panic setting in the day before Grainne kept us both calm and for that we will be totally grateful. Future brides and grooms could not go wrong booking this amazing and special pair. Hope this conveys how truly grateful we are and how much we loved the ceremony. From the start to finish of our wedding preparations both Grainne and John were absolutely amazing. They met with us, gauged our personalities and helped us choose our songs. The music at our wedding ceremony was exquisite. All our guests are still talking about each and every song played and most of all "the prayer". So much so and something I've never seen before the church erupted into an impromptu round of applause. That moment alone will stand in our minds for many years to come. Grainne and John you have both made our day so magical and special and we can't thank you both enough. Words can't express how highly I would recommend you both to any couple starting the wedding planning journey. I heard grainne and john sing at my friends wedding in ballyconnelly co galway in may 2015. I was blown away by their version of the prayer.i would definitely be looking into them for my own wedding.the response and the emotion from all the guests made it a lovely ceremony and one that I will never forget.i would definitely recommend to anyone. Grainne and john are beyond words, but I had written an email to thank them after our wedding in May so I will use that. You will not be disappointed with this duo. "Everyone was absolutely blown away by your singing, I'm not joking absolutely everyone at the wedding and I do mean everyone, has been taking about your singing all weekend. One girl, whom isn't engaged, wants your number for her wedding! Loads asked me for your details so I hope you get something out of it. All the boys were amazed as well, all the photos show them with their jaws on the floor! And apparently all the girls were crying, ye really did move everyone, us included! It was so amazing we couldn't have even imagined it any better, you're both so talented! Magic!" We organised a charity concert recently and discovered Grainne and John through a wedding fair. They volunteered to come along and support our concert. They were brilliant, so professional. A straw poll at the end of the show placed them 'top of the bill' to most of our supporters. They really 'brought the house down' at the finale. Couldn't rate them highly enough they really are the best. Both slow, romantic and more up tempo numbers are in their repertoire and all done with true feeling. I could not have been more pleased with Grainne and John. So professional, so relaxed and so easy to deal with. No query was too big, too small or too silly. We really were absolutely delighted with them. Delighted with Grainne & John, from the picking of the songs to the quality of the performance we couldn't have been happier. Without a doubt we'd highly recommend them to any couple getting married.